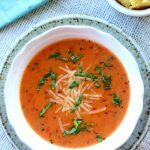 This Slow Cooker Tomato Basil Parmesan Soup is the most creamy, comforting and delicious soup ever! Whenever I make it I get tons of compliments. It is a favorite with my husband and family and is requested often. I’ve included both a slow cooker version and a stove top version with step by step photos of the process. Even if you’re a beginner cook you can make this recipe! And everyone will think you are an advanced chef when you serve it. It is amazing. I’ve decided to update this well-loved recipe from 2009 with step-by-step photos and better directions. This recipe has been the most popular recipe on my blog for a very long time (it has been pinned half a million times and has over 1.3 million views!). And I’m so glad that it has taken off because it is such a yummy recipe. I got the original version of this recipe from my talented Uncle Gary (he’s a seriously good cook). I’ve changed a few things about it to suit my tastes and also made a slow cooker version of the recipe (because that’s how I roll). The picture of the soup above was taken by a gal from the BYU alumni magazine. She came to my house to take pictures of me for a magazine article they did on me and my 365 Days of Slow Cooking project. So thanks to her as well! I’ve added my own pictures below and tried to make it easy for even beginner cooks to make this recipe. The first thing that you’ll want to do is finely dice some carrots. I like to dice my carrots fairly small. But, Karen, why would you put carrots in a tomato soup anyway? Good question, young apprentice, good question. 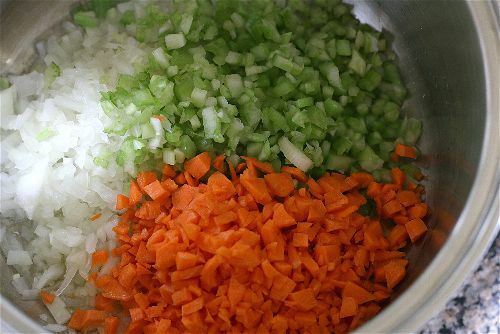 We are making a mirepoix. Don’t get scared by that word. It’s just French for diced carrots, celery and onions. The reason that we use these veggies is because when they are sautéed or roasted they can become the flavor base for soups, stews, sauces and stocks (not the wall-street kind). 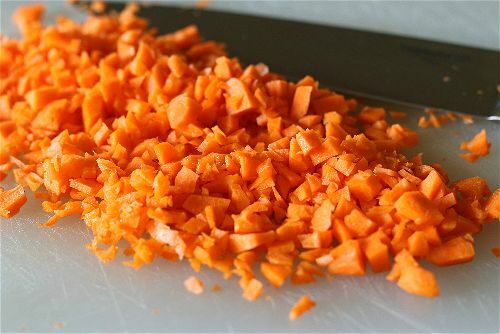 Sometimes for this soup I actually grate the carrot. It’s up to you! 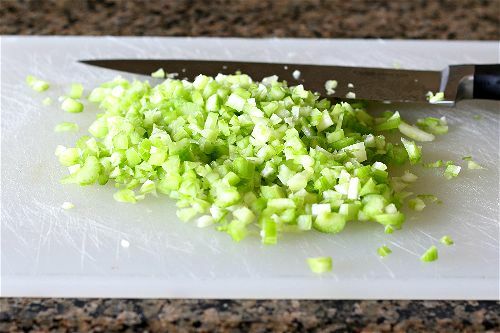 Next we will do the same thing with celery and onions. You’ll want about one cup each of carrots, celery and onions. When measured in grams it’s about 115 grams of each vegetable. I think I used about 2 stalks of celery to get to one cup. Don’t worry if you have a little more or a little less than one cup. It will all work out. That’s the great thing about cooking, it doesn’t have to be as accurate as baking. Finally cut up your onion. Don’t cry about it! It’s not that hard. I just discovered this one minute video that helped me understand the best way to cut an onion. And also, did you know that having a sharp knife can really help with NOT crying? Yes, it’s true. So sharpen your knives. Next you are going to sauté the carrots, onions and celery in the bottom of your soup pot. First warm up a little oil over medium high heat. To see if the oil is hot enough throw a bit of carrot or onion in there. If the oil reacts by sizzling then the oil is hot enough. You’ll stir frequently for about 5 minutes. When the vegetables soften a bit and the onion becomes more translucent (see through) you’ll move on to the next step. You’ll add in the spices and some freshly minced garlic. Minced just means it is very finely diced. I like to use my garlic press to mince garlic. I don’t even have to peel the garlic. It’s awesome. 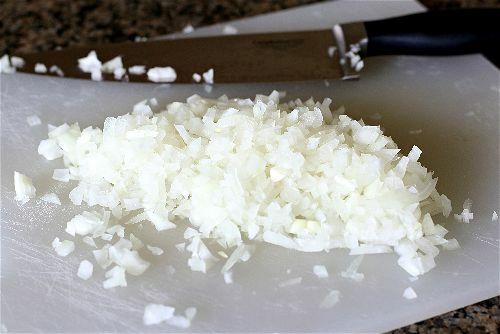 Or you can always just dice it up super finely with a chef’s knife. But why didn’t you add the garlic in with the onions and carrots? Good observation, young master. Well, I feel like garlic cooks fairly fast and it’s easy to burn. So I choose to add it towards the end of the sautéeing. Give it a couple of minutes and then move on to the next step. At this point you’re going to add in chicken broth and tomatoes and a bay leaf. I use dried bay leaves (you can find them with the spices in your grocery store) but you can use a fresh bay leaf if you have one. Bay leaves just give it that extra flavor boost. You don’t eat it though, you’ll take it out and throw it away after the soup is finished cooking. I usually don’t have chicken broth on hand so I use chicken bouillon instead. (If you want to know the difference between the two you can read this article I wrote about it). Also, I like to buy the petite diced tomatoes as opposed to the regular diced tomatoes. I just prefer smaller bites of tomatoes and I think you’ll agree with me once you try them. Now you’re going to let the soup simmer. If you’re cooking it on the stove top you’ll let it simmer for 15-20 minutes. Simmer just means you’re cooking it right below the boiling point. It doesn’t get to the bubbly stage–but almost. If you’re cooking it in the slow cooker you’ll let it cook on low for up to 7 hours or you can cook it on high for less time. While the soup is simmering on the stove (or towards the end of several hours in a crockpot), you’ll want to start making a roux. We’re learning so much French today! 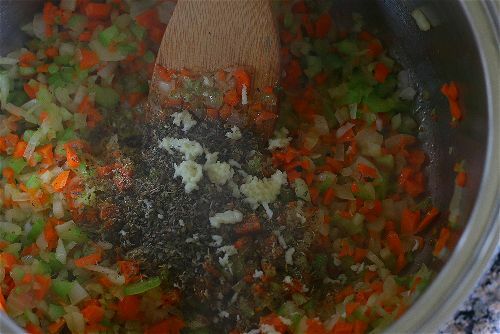 A roux is pronounced ROO and it’s just a way to thicken soups and sauces and such. 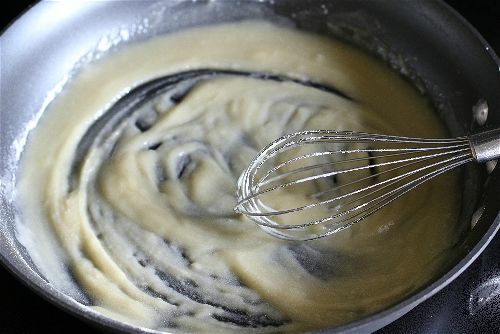 Typically to make a roux you will mix some type of fat with flour. For this soup, we will use butter as the fat. YUM. Butter makes everything better! Start by melting a stick of butter over very low heat in a fairly large skillet. Don’t rush the process. Just do it over low heat. 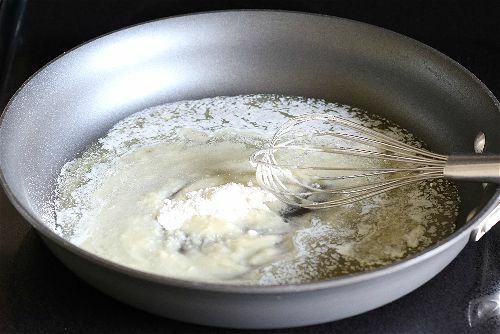 Once the butter is all melted you will every so slowly whisk in your flour. I just add about a tablespoon at a time. Once you add in all the flour it will look nice and creamy. Just keep stirring. This is a good time to grab your 9 year old kid and tell them to whisk for the next 5 minutes. And if they give you any guff send them to me. Once the 5 minutes is up you’ll dip a measuring cup into your soup pot (or slow cooker) and pour three cups of the soup into the roux. Stir it with a whisk immediately. It will start to thicken really nicely, like so. Once it’s thickened you will add the contents of this pan back into the soup pot or slow cooker. You’ll stir it all together now. It’s starting to look at smell goooooood! You’ll now add a pile of parmesan cheese. I always get a really good deal on Parmesan cheese at Costco. It’s a pretty big bag so I usually put it in the freezer. But it definitely comes in handy for recipes like this. Finally, you’ll add in salt and pepper and some half and half. You can find half and half next to the cream and milk at the grocery store. Half and half is just a mixture of whole milk and light cream. It’s good to use when you need something heavier than regular milk but not as rich as heavy cream. I actually think that you could just use whole milk for this recipe and it would still be awesome. I never have whole milk at my house though. If you wanted to try it with just plain old 1% milk I bet you could and I bet it would be fine. 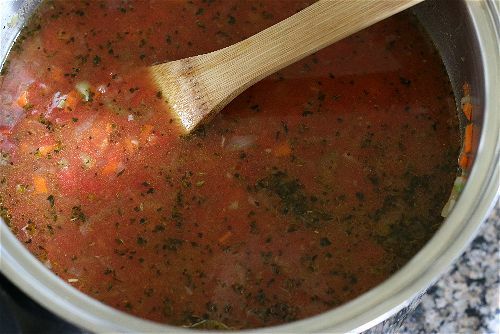 I wrote a skinny version of the tomato basil parmesan soup here if you’re interested in being ultra healthy. It’s finally time to eat! Hooray! We like to serve this soup with rolls. I hope you like it as much as we do! Here is the slow cooker version of the recipe. For the stove top version keep scrolling down. 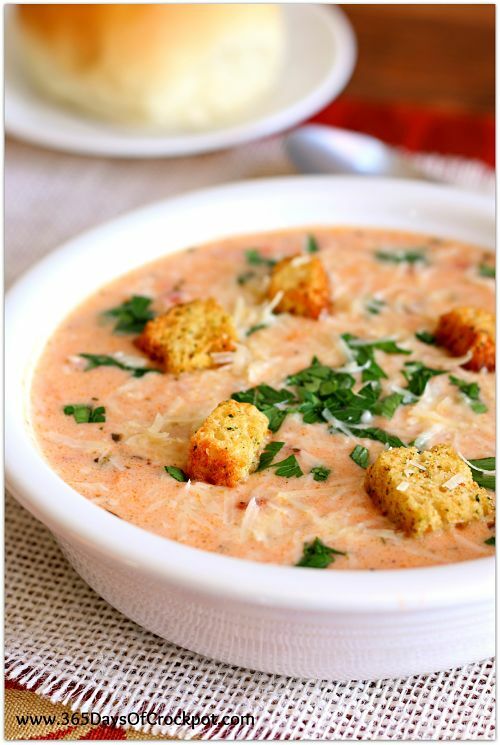 This Tomato Basil Parmesan Soup is the most creamy, comforting and delicious soup ever! Whenever I make it I get tons of compliments. It is a favorite with my husband and family and is requested often. Even if you’re a beginner cook you can make this recipe! And everyone will think you are an advanced chef when you serve it. It is amazing. First you’re going to sauté the carrots, onions and celery in skillet over the stove top (If you don’t want to saute your vegetables you can add them directly to the slow cooker. I’ve used both methods and while I think sauteeing is the best choice you really can do either). First warm up the oil over medium high heat. To see if the oil is hot enough throw a bit of carrot or onion in there. If the oil reacts by sizzling, then the oil is hot enough. Add in your onions, carrots and celery. Stir frequently for about 5 minutes. When the vegetables soften a bit and the onion becomes more translucent (see through) add in the garlic and the oregano, basil, salt and pepper. Sauté for two more minutes. Add this mixture to your slow cooker. 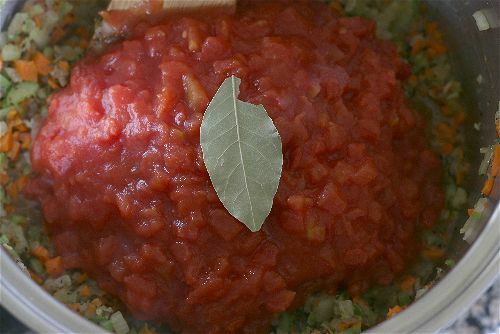 Add the diced tomatoes, chicken broth and bay leaf to your slow cooker. Cover and let cook on LOW for about 5-7 hours or on HIGH for about 3-4. The carrots should be tender. Now you’ll make a roux. 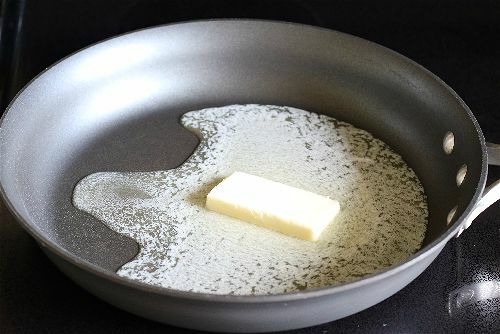 Start by melting a stick of butter over very low heat in a fairly large skillet. Don’t rush the process. Just do it over low heat. Once the butter is all melted you will every so slowly whisk in your flour. I just add about a tablespoon at a time. After the flour is all added in continue to whisk the mixture for 5 minutes. Once the 5 minutes is up you’ll dip a measuring cup into your slow cooker and pour three cups of the soup into the roux. Stir it with a whisk immediately. It will start to thicken really nicely. Once it’s thickened you will add the contents of this pan back into the slow cooker. Give it a stir. The soup will begin to thicken. Add Parmesan cheese and whisk to blend. Stir in warmed half and half (if it’s warmed it will prevent it from curdling). Now add in extra salt and pepper. I like to add in about 1/4 tsp of salt at a time until I get it perfect. The amount of salt you’ll use will depend on if you use low sodium broth or tomatoes and other factors. I usually add in a teaspoon more of salt. Cover and let simmer on the low setting for about 10 more minutes. You can use whole milk instead of half and half. You can even use regular milk if you’d like. First you’re going to sauté the carrots, onions and celery in the bottom of your soup pot. I used a 4 quart soup pot (this makes about 3 quarts so you’ll want at least a 4 quart pot). First warm up the oil over medium high heat. To see if the oil is hot enough throw a bit of carrot or onion in there. If the oil reacts by sizzling, then the oil is hot enough. Add in your onions, carrots and celery. Stir frequently for about 5 minutes. When the vegetables soften a bit and the onion becomes more translucent (see through) add in the garlic and the oregano, basil, salt and pepper. Sauté for two more minutes. Add in the diced tomatoes, chicken broth and bay leaf. Bring it to a simmer. Simmer for about 15 minutes, or until the carrots are tender. 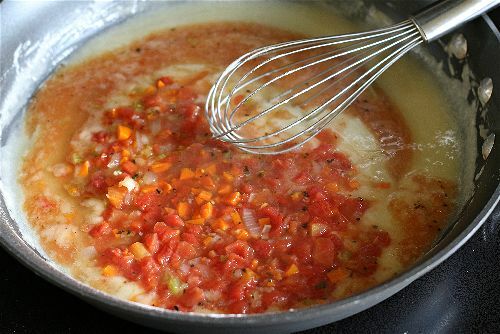 Once the 5 minutes is up you’ll dip a measuring cup into your soup pot and pour three cups of the soup into the roux. Stir it with a whisk immediately. It will start to thicken really nicely. Once it’s thickened you will add the contents of this pan back into the soup pot. Give it a stir. The soup will begin to thicken. Simmer over low heat 15-20 minutes, stirring occasionally. *You can use whole milk instead of half and half. You can even use regular milk if you’d like. I have made this recipe many times. Since it’s just two of us nowdays, I often freeze half of it so we can come back to it later. We love the soup but too much of a good thing all at once can become a bit of a bore. 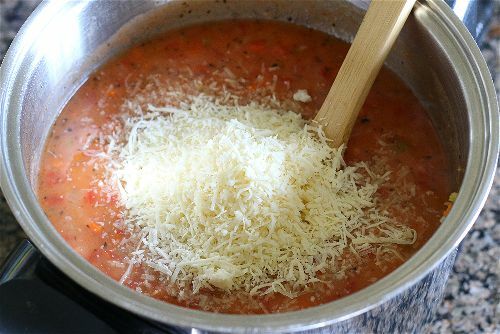 To add extra flavor, I often add cheese rind when I’m simmering the soup…if I have any. I’ve used Asiago, Mimolette and Thousand Day Gouda, each to good effect. I would like to know your thoughts on making this with fresh tomatoes and basil from the garden. Should the tomatoes be peeled? And should the recipe be altered in any way? I think it would taste amazing. I would add basil at the end since it is more fragile when fresh and won’t hold up in the slow cooker. I would just dice up the tomatoes and add them in. If you want to peel that would be good too. This is delicious! Even my tomato-hating youngest son loves this soup! I did throw the soup into my Vitamix from the Crockpot to make it smooth so that my son wouldn’t see the individual tomatoes! It made it so creamy that I only needed to make half the amount of roux, so I could cut a few calories! Thanks for sharing this recipe. oh, good to know about the blender! Love that idea. I also pureed mine in the vitamix, no roux at all. It was perfect. Did you ever try making it without butter and flour? Just curious. 🙂 My family is OBSESSED with this soup. Thank you!!!! I haven't yet. I really should though! I made it tonight without the roux and it is still fantastic!! Making a grocery list right now! Can't wait to try it! Gorgeous soup Karen. I love soups that start with a roux. The BEST! Can't wait to enjoy this on a chilly fall day. I want to make this but am wondering what kind of Parmesan to use? I just use grated parmesan found by the other fresh cheeses in the grocery store. Ok so I just made this soup, on the stove top, and it totally tastes and smells of throw up. I don't know what I did wrong, because I followed the recipe. I also have had this soup before when a friend made it…. so this is totally weird. Any insights??? Half and Half is found next to the heavy cream in the grocery store. You'll want to warm it up so it's not cold when you add it to the soup. This prevents curdling. I know this is an older post, but can this soup be frozen after cooking? 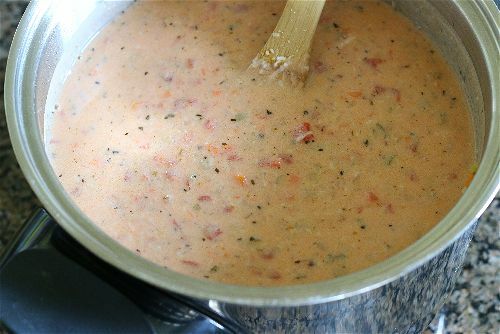 I have made soup very similar to this for years, the recipe was shared with me, the tomatoes, onions, celery, basil, grated carrots, everything except the cheese, roux, and half and half. I have loved this soup without these ingredients. I can't wait to try it with the creamy ingredients! I made this a while ago in the crock pot and it was delicious!!! We had it with turkey meatloaf. I'm looking up the ingredients so I can make this during the blizzard. I can't wait to make this again. This time we'll have it with turkey meatballs. Thanks for this great recipe! Haven't made this yet but for the cheese issues I've read, you can buy the pieces of rind at the cheese counter and add them to the soup while it is cooking, will give the cheese flavor and then just top with your grated cheese when you serve it. K, Great idea. I'll have to try it like that next time. It would be nice to cut out that step!! The soup was great! I did three things differently. I cooked everything on HIGH for 4 hours. In addition after the four hours were up I put everything in the blender. After the blender I put it all back in the crock pot. Added the parm cheese and FAT FREE Half and Half. Cooked it for ten more minutes. Came out creamy, delicious and super healthy. No need for flour or butter. I made this Sunday in the slowcooker and it was amazing!!! My husband who is a very picky eater and hard to please ate this soup up! I will be making this many more times!!! I love soups at all. This one is absolutely fantastic! I just made this soup. Amazing! Even the soup haters in the family loved it. Thank you for the recipe! This soup is wonderful!!! I used less butter, more veges and fat free half and half and it was delish! I also included some shredded chicken to increase the protein (my hubby doesn't consider soup a meal unless there is meat in it:) and it was really good. Thanks for the great recipe! Its a new staple in our household! Although it's 112 outside, I think this might have to be included in our menu next week. This recipe sounds delicious, thank you very much for sharing! I'm sure it would freeze fine with the cream in there. Just warm on low. Just wondering how this freezes? It looks sooo good, and I have a huge crockpot. If I made it, I'd probably double the recipe and freeze half. Should I omit the cream to half of it and add in when thawed? Any thoughts? I followed the recipe as is and it was like the best soup ever….I don't even like tomatoes! My 21 month old said "more more"! I found this on pinterest and made it last week. Oh my gosh. This is the best soup I've ever made, and I am a big soup fan! I'll definitely be making it again. Thanks! I was gone for 10 hours at work so Phase One was in the crock pot that whole time and it turned out great. Can't wait to make this again!!! Thank you! It makes 2 quarts so that is 8 cups. If each person had a cup of soup that would be 8 servings. can you tell me approximately how many this recipe serves? I want to make it for our churchs' Lenten soup night, but am not sure how many times to multiply this recipe. Thanks! oh! I also added shredded chicken breast to make it more of a main course dish. It worked really well! Thank you so much Karen. I decided to make this due to a pint of cream that I was getting worried about in the refrigerator. This soup is amazing! You have definitely made me a tomato soup fan. It makes me think of this other tomato soup at a hotel (and the chef was not willing to share). My family and I appreciate your sharing! Sorry for the delete and repost…forgot another detail! to the person who was asking how to make it not in a crock pot. I have done it twice. I am gone from home too long to cook it in a crock pot. I chopped my veggies up in my food processor. I cooked the onions in some olive oil about 7 min till they were clear and soft, then added and cooked the carrots and celery for about 10 more min. 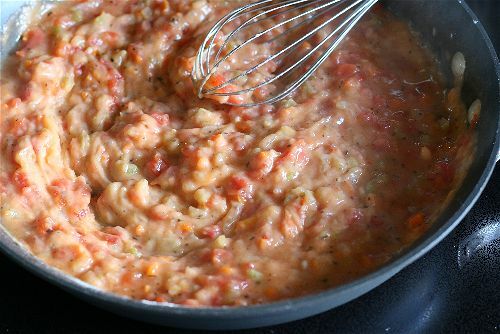 I then pulsed the tomatoes in my food processor and dumped them in the mix. Added the chicken broth and all the spices and cooked for about 45 min or so on my stove top on med till the veggies were cooked down and soft. Then pretty much followed the rest of the recipe Turns out great! with ROASTED canned minced tomatoes…. Also, using a blender for the base works real well! Just wondered if you used fresh grated parmesan or the parmesan cheese powder? I used fresh and though the soup is tasty, it's a bit of a chewy, stringy mess! This is the BEST SOUP EVER!!!! Yum, Yum Yum!!! 5 STARS and then some! Anyone know about how many calories per cup this has in it? I LOVE THIS RECIPE!!! I blogged about it here: http://sweatlikemambo.com/2012/01/25/inspiration-silverlake-and-the-de-flowering-of-my-crockpot/. Thank you so much for sharing. This was my first crockpot recipe EVER, and I am sold now! Has anyone tried to make this soup in a regular cooking pot(not a slow cooker)? I do not own a slow cooker right now (I am living in another country so my US electronics do not work), but wasn't sure what the times for cooking would be??? I made this last night. I used fat free half and half to make it lighter. I also used a hand blender to hide all of the veggies from my picky hubby 🙂 I didn't have any problems with the cheese. I used the grated kind of added just a little at a time stirring it in well before adding more. Will be making this again! This is the BEST soup! I have made it … well, i'm making it right now & I believe it is the 4th time. In a very short period! My in-laws are coming today. We had a dinner party last weekend & i served it then too. Always a hit. SO SO GOOD! 🙂 Thanks! For low carb, DON'T add rice flour in place of all purpose. Use almond or coconut flour. I think almond would be better since this is a savory soup but do your adjusting. Rice is CARB LOADED. Thanks Woozle, I was scanning the comments, hoping for a low-carb tip with the roux. I was thinking along the lines of xanthan gum or glucomannon. These would work, sprinkled into the base, but not necessarily for the roux. I’ll possibly try the almond flour. I'm gonna make this monday night and my family will love me. Making yummy food is another way to show your love. yes, you could use the veggie broth and I'm sure it would turn out just fine. Make sure to salt and pepper and season to taste at the end. Let me know how you like it. This Soup looks so GOOOOOD! Would It be o.k. to use Vegetable Broth instead????????? This is ABSOLUTELY delicious. I think, however, you need a better picture. The one you have doesn't do this soup justice. Im gluten free as well, I was going to try it with coconut flour! could you use rice flour or something like that? I am gluten-free– is there anything you'd suggest as a sub for the flour? I like garlic a lot too…I'm going to add it in next time. thanks for the tip. Karen- The garlic was perfect in it! Just gave it a little bit of garlic flavor since I took the clove out at the end. I am sure it tastes great without it but we like to eat garlic in everything! The family LOVED IT! So glad I found the recipe on Pinterest! Made this today. It is very good, but wasn't as tomatoey (is that a word?) as I wouldve liked. I actually added a small can of tomato sauce to it and wish I wouldve had some tomato paste because it still wasn't tomatoey enough for me. Will def make this again. I made the soup and actually pureed the tomato mix once it was cooked. By far one of the best tomato soup recipes I've ever had. AMAZING! I made this a couple days ago and my family loved it!!! Thank you! mmmm…I bet the garlic will be awesome. And for a creamy texture blending it would work great. I prefer the chunkiness. Let me know how it turns out. When I think tomatoes and basil and Parmesan I think garlic. So for the last hour I added a whole peeled garlic clove that I will remove when it is time to serve. I also decided to emulsify the soup for a smoother texture. I am very excited to try it! Hope it tastes as good as it smells. 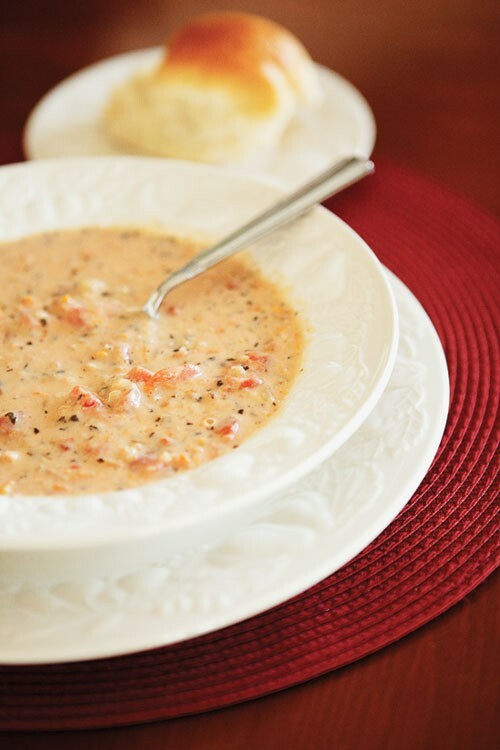 Absolutely love this soup, we tried first last year when my little sister saw it in the BYU alumni magazine–my family loves it! Just made this tonight after seeing it in the BYU alumni magazine and loved it. It's only my second crockpot recipe ever and I'm in love with how easy it was and how yummy it turned out! Would you mind if I posted in on my recipe blog (with a big link back to you of course)? This is a delicious soup recipe. I always like using a hand blender on my soups, so that would be my only change to the recipe. Also, a trick for reducing the fat is to use fat-free half and half, which is just as creamy but with no additional fat. Since I like using real butter in my recipes, using the fat free half and half really helps to control the fat content. This is my adaptation of the recipe so that I could use my surplus of tomatoes, freeze just the base, and make the soup later. I didn't use canned tomatoes (you will have to add salt to taste at the end because the canned tomatoes have salt in them) but used fresh so I used a lot more than the cans. I used about 6 cups blended fresh tomatoes ( at this point I removed all but 1 cup of the tomatoes to make room in the blender for the other veggies). I added the 1 cup celery, 1 cup onion, 1 cup carrots, 2 cloves garlic(the garlic is a must! ), the basil and the seasonings except the bay leaves. I tripled the recipe and it filled a large oval crockpot. I added the bay leaves and let that cook all day or you can cook it for a few hours in a pot on the stove if you're home. After it cooled I measured 4 cups and put into quart sized freezer bags. this is my tomato basil soup base. 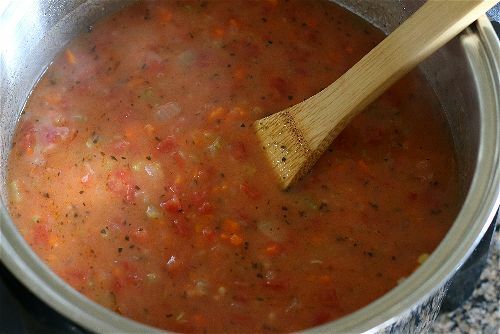 When you are making the soup, Thaw the bag, add 2 cans or 4 cups chicken broth, heat soup to simmer, in another pot combine the 1/2 cup melted butter and 1/2 cup flour to make a rue and wisk in the hot soup one cup at a time. Then wisk in 2 cups of warmed half and half (or whole milk) and add parmesan,( I cut this to 3/4 cup). We served it with french bread for dipping. Yum! Ok, I loved loved loved this soup. I had some questions though. I had an issue with the Parmesan getting rubbery and sticking to the spoon. I wonder if I could leave it out (just sprinkle on top). Or maybe it was the brand (it was a quality brand name). Or could I replace with cheddar? Or shoud I use a stick blender to incorporate it more or add it during the flour/butter mixture? I definately will use less cheese and milk instead of half & half. I added some leek and some fresh tomato. It could be made into a thicker dip for bread or chips. It could get some heat with peppers. You could add mixed vegetables. Lots of possiblities…but am I brave enough to experiment? That's the question. I hate throwing food out or wasting it. But I'm inspired to try out some variations. I had this again last night and I used whole milk instead of half and half. Just as good, and not as many calories. This is delicious! I've tried different tomato basil soup recipes but this is my favorite. Thanks for sharing! We had this for dinner tonight and we loved it. I make the tomato basil soup out of the Ivory Favorites cookbook all the time so this was a fun variation of one of our fav. meals. Thanks! !